League of Legends, developed by Riot Games, is one of the games that I have spent most time playing. The game has been around for seven years and has not lost any of its power to captivate. From its multi-player format situated in a theatre of battle, “League” provides players with continuous challenges and battles for territory. League grew at such a dramatic rate that by its third year it was the most played game on PCs across North America and in Europe. These numbers are based on the amount of hours the game was played. 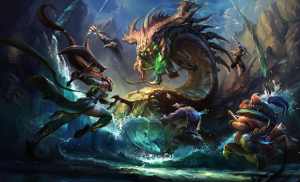 There are three game modes and three maps to navigate in League of Legends. Players battle one another for up to an hour for the opponent’s Nexus, or to acquire as many points as possible and maintain them. Strewn throughout the game modes are smaller objectives to give players advantages towards attaining overall victory. Each game mode has champions, which are controlled by players or teams. Equipped with differing skills and abilities, champions start out with low ability that grows over time as the champion achieves positive results. The goal is to reach level 18, which is the maximum, while gaining points along the way to unlock the greater abilities of the champion. Teams and gamers also begin with small amounts of gold that must be expanded over time, by eliminating minions and monsters. And as players or teams accrue their gold tally, the ability to increase their champion grows, as well as the means to slowly destroy their opponents. All of the ability brought into a battle lasts only for the duration of that battle. After each match the levels are reset. The adventure takes the player and teams through Twisted Treeline, Howling Abyss, and Crystal Scar. Each mode provides the gamer with unique challenges and opportunities to develop the champion or destroy the opponent’s Nexus. 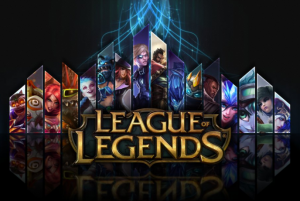 League of Legends is a hyper-interactive game, a game that provides many options within every level and provides the critically tested mind with non-stop action. From the beginning of the gaming adventure to the end of each battle, League of Legends places the gamer inside the image field. The high definition computer design allows the player to enjoy gaming at its absolute best. The ability to chat with other players and competitors online bring the player one step deeper inside the world of the “League”. League of Legends was given a Metacritic score of 78 points out of a total of 100. IGN gave League of Legends a score of eight out of ten total points. League is known for superior graphics and innovative design elements. The imagery is of course second to none. League of Legends has garnered awards from IGN, Gamespy, 1st Game Developers, and Golden Joystick. It has been recognized for best strategy and game choice awards. Within this vast network of gamers are a host of professional leagues. Gamers from around the world gather throughout the year at tournaments featuring the best League of Legend players from across the globe.